Hi, my name is Ros McFadden and I am a member of the congregation at St. Lawrence’s Church in Bradwell Village, where I live. The church is in on of the villages that the modern town of Milton’s Keynes has built up around. We have a small but diverse and faithful congregation form babies up to nonagenarians! Thieves have stolen the lead roof from our 800 year old village church. Please help me raise money towards its replacement. Our little church means so much to me. We have been without a minister for a year now and we are in the process of recruiting an interim minister. This has been a difficult time for our congregation. We are approaching Autumn and we really want to protect this historical building. Please help me raise some money and no matter your beliefs or non beliefs spare a prayer or positive thought to help us get our roof repaired. The Fund will donated by me to the church fund and will be used directly for the roof replacement, because it appears the insurance will fall short of what is needed. As a tax payer we will then be able to claim gift aid. I would just like to take this seasonal opportunity to give thanks for the support that has been shown for our church St.Lawrence's and our plight to replace the stolen section of roof. We have raised £365 so far. We have had an architect assess the damage and the needs for replacement. The cost of the roof will be approximately £12-14,000. The insurance will pay out the maximum of £7,000, so as you can see there is a significant shortfall. The church will sell the remainder of the lead to help fill the shortfall, because it has been agreed that the roof will be replaced with Stainless Steel. There is already a section of the existing roof that is covered in this material and it was decided this was the best option and has been agreed by the heritage organisations and the Diocese. 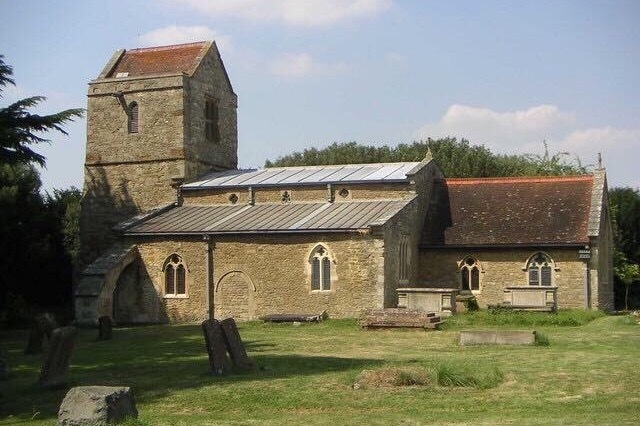 It would be wonderful if you aware of anyone who has an interest in Old Bradwell, historic churches or the importance of maintaining our heritage please share this campaign or make a donation yourself. The local paper Citizen MK ran an article about our stolen roof and my campaign to raise some funds and today apparently it will be featured on the Radio 2 at lunchtime (25/10/18). It would be great to get some shares for this fundraiser. If you love the heritage of our country, if you are a Christian, if you are a lover of historic buildings, if you hate the injustice of theft or if you are just a very kind person please consider donating to my fund so we can replace our Church roof.